Fresh from being recently nominated for ‘Best African Act’ at this year’s MOBO Awards as well as his smash hit single “The Thing” being released in the UK via Ministry of Sound, Ghanaian Pop star ATUMPAN aka Talking Drum is proud to release his brand new single “Clap Clap”, produced by Mix-Master Garzy (Sarkodie, R2Bees, 4x4) and the glorious new music video to go with it. Directed by George Guise for Visionnaire Pictures, whose directorial credits include Azealia Banks, Tiwa Savage and Mark Morrison among others, the colourful and effervescent visuals for “Clap Clap” see Atumpan in his very element as he brings the positive and affirming message of the single further to life, making an ode to the beauty of urban African men and women of our generation irrespective of size, height of colour, while giving a subtle visual nod to the late great Michael Jackson. 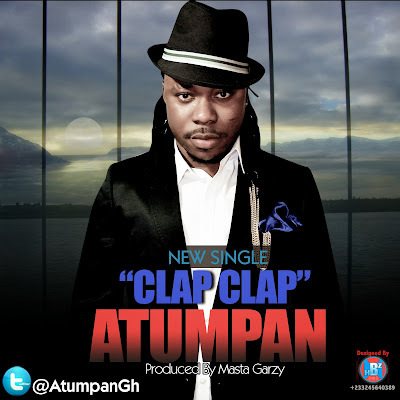 The infectious “Clap Clap” single has starting to take over radio airwaves across Africa and Europe, having been premiered by DJ Abrantee on Choice FM and on BBC 1Xtra by DJ Edu to rave reviews, and with Atumpan’s fans and audiences already doing the “clap clap” all over dance floors across the continent as the song commands, the excellently crafted video comes at exactly the right time. This is the long-awaited new Afrobeats anthem from Atumpan to pick up where the massive “The Thing” left off… “Clap Clap” will be out on iTunes on October 27, in the meantime, enjoy the exciting new Visionnaire-directed music video below.